Growth form: Sedge. Flowering. May–Jun. Status: Native. Common. Also recorded: Bahrain, Kuwait, E Saudi Arabia, UAE. 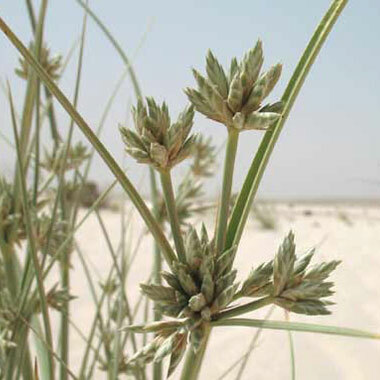 Habitat & distribution: A plant characteristic of deeper sand, especially larger dunes, but in Qatar also locally abundant around coastal areas on beach sand and on white sand inland. Occasional to locally frequent in other habitats, such as sandy wadis and runnels. Uses: Grazed, but considered inferior as fodder. Jongbloed et al. note that the rhizomes are sometimes used as food by humans in times of hunger. Notes: This is a very variable group comprising a number of different described varieties and forms, but further study of plants in Qatar and other parts of the Gulf is still needed. For further information see Batanouny and Mandaville.